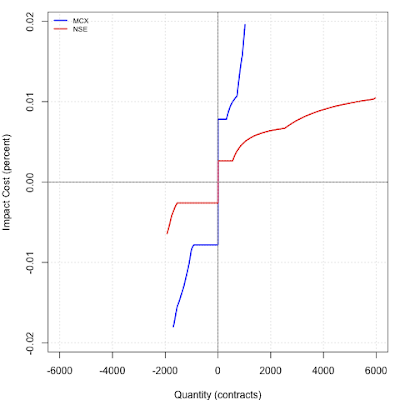 Currency futures liquidity ahead of the forward market? At NSE, currency futures did $1.8 billion yesterday. With this, India is starting to look like a rare country where the turnover of the currency futures market is big when compared with the currency forward market. (Gurnain pointed out, in the comments to this post, that this is the case in Brazil. I'm not aware of any other country where this is the case). Turnover is, of course, not liquidity. An exchange can fake liquidity by doing round-trip transactions which boost trading turnover. Liquidity is about the transactions cost faced when transacting. Liquidity comparisons between the OTC market and the futures need to take into account the fact that the OTC market trades bigger contracts. So, let's see what impact cost is visible in the information present on the web, pertaining to closing time (5 PM) on the 22nd. The quantities available at the best five prices are visible on the web. There is surely more available beyond the top five in the book, but you probably don't want to trade at those adverse prices. Let's focus on 1000 contracts, or $1 million. Based on conversations, I get the sense that the forward market would have impact cost of 0.01% to 0.02% for this transaction size. The graph shows that the NSE contract had smaller numbers than this for both buying and selling. (Click on the graph to see it more clearly). The futures market seems to be able to serve upto $6 million to a buyer and $2 million to a seller, while suffering reasonable values of impact cost, within the top five prices. This is admittedly one data point. Late in the day, I noticed a big number for turnover and wondered what was happening to liquidity, so I looked at the `market by price' display visible on the web. But for a currency futures market to beat a currency forward market on liquidity is unusual by world standards, even if it is for one data point.This is particularly remarkable given the tiny window of operation that RBI has permitted for the futures market: all products other than INR/USD futures are banned, and participation by FIIs and NRIs is banne. In 1993, before the World Wide Web and before the commercial Internet, AT&T ran a set of television advertisements. They are visible on youtube. At first blush, a lot of it sounded wide eyed and futuristic. But to people who were in the field then, everything in the ad was reasonable and incremental; merely a matter of scaling up what had been figured out. It was a great time to be alive, those early days of the Net. To AT&T iphone customers of today in the US, almost everything in the ad is now reality. This was a post on rec.humor.funny on 20 April 1994. Everything in this dystopic vision came out true by 2009 too, other than the last one. The bulk of the papers and slideshows in the 5th Research Meeting of the NIPFP-DEA Research Program are now up on the website. (A few stragglers are still trickling in). Editorials in Financial Express and Indian Express in response to Dr. Subbarao's recent major speech about the role and function of RBI. And here is another interesting speech by Dennis Lockhart of the Federal Reserve Bank of Atlanta. On voxEU, Tao Sun and Xiaojing Zhang talk about China's deepening de facto openness and its consequences for policy. In parallel with the slow Indian policy evolution towards Indian Depository Receipts (IDRs), Kathrin Hille has a story about China moving towards having foreign listings, which are a critical building block of Shanghai as an International Financial Centre. A nice article in The Economist on CAPTCHAs. The wonderful new world of air power: UAVs. Makes you want to take a break from the dull world of economic reform and sit down and make one. Ila Patnaik on the claims that the world now has something to learn from RBI on how to do financial regulation. Jason Zweig in Wall Street Journal on data mining bias. I always find it amusing that to the computer software industry, `data mining' is not a loaded phrase. Footage about Bombay of 1932. Watch Gautam Bhardwaj and Lant Pritchett on Ila Patnaik's TV show. A. Seshan in Hindu Business Line on RBI's conflicts of interest. Monika Halan in Mint on inflation indexed bonds. In Financial Express, Bibek Debroy and M. R. Madhavan look back at the achievements of the first 100 days of the UPA-II. Anatole Kaletsky in The Times on calls to downsize finance in the UK. Swapan Dasgupta in The Telegraph on the consequences of the BJP ceding the middle ground. PIL against the statue in the ocean. Jeff Hammer in Financial Express, on fundamental problems of health care in the US and in India. I have a column in Financial Express today on the rationale for independence of the central bank, and how this is operationalised in democracies. The path to interest rate futures was afflicted by important mistakes in policy. I wrote a piece in Financial Express today about how, ironically, the damage caused by these mistakes is smaller than meets the eye, given that we have a stunted bond market in the first place. Jayanth Varma is astounded that some corporate treasurers think that their derivatives positions should not be backed by collateral. I am too. On a related track, there is news today that RBI is pushing banks to report interest rate swap transactions through CCIL. This is in the right direction. The role model here is the futures clearing corporation, e.g. NSCC. Futures clearing corporations are designed to enable safe trading between strangers, which makes possible the nice efficiencies of the anonymous electronic market. In doing this, futures clearing corporations demand the identical collateral from all customers. There is no question of NSCC exempting SBI from collateral requirements because SBI is para-statal. It is through such toughness on collateral requirements that NSCC has built up a 13-year track record, of surviving quite some market turbulence, as central counterparty. More generally, the `recipe' of how clearing corporations work has fared well in the last 100 years, barring a few failures which are really about operational risk, corporate governance, malpractice etc. If someone is serious about running a clearing corporation properly, it can be made to work. All that one has to do is to ensure sound ownership and governance in the exchange business. Put out a draft rule change for comments. Genuinely, substantively, listen to the comments. Consider it possible you may be mistaken. Put out a modified rule on the website, after which everyone should be obeying it regardless of whether there has been a meeting with RBI officials or not. Rule changes should be appealable at an SAT. This is a better process flow, one that expresses the goal of having rule of law. SEBI is the most advanced financial regulator in India today, in having developed the closest approximation to this process. I am not a legal expert, but in my understanding, at present, if two corporations enter into an OTC derivative against each other, this is not enforceable. Enforceability is limited to the class of transactions where one of the two counterparties is a bank. This is reminiscent of 1970s vintage rules of the game in exchanges. Here, exchanges forced the public order flow to only go to market makers. Public orders could not match against each other. Or to say it differently, public orders could not compete with the quotes posted by the market maker. This was a way to rig the rules of the game so as to favour the market makers. In similar fashion, the existing rules with banks and OTC derivatives in India (if I have understood them correctly) are a way to prop up the profitability of banks at the expense of customers of banks. This is anti-competitive. It helps ensure that the inter-bank OTC market is a rigged game, one that favours banks at the expense of corporate customers. It is one more reason why exchange-traded derivatives are so important in India. It is only on the NSE screen that, for the first time in India's history, we are getting a genuine, competitive, transparent market for the currency or interest rate futures. These kinds of efforts at rigging the game, in the context of corporations and OTC derivatives, help increase the chances that India will be a pioneer by world standards on the shift of the currency and bond markets to the exchange platform. In terms of the ratio of the size of the OTC currency forward to the size of the exchange-traded currency futures, India is already one of the remarkable places in the globe. While futures clearing corporations should give no quarter to corporate customers as far as collateral requirements are concerned, I think there is a case for having bigger position limits for corporate hedgers. There is a genuine tension here. If small position limits are used, this reduces the usefulness of the derivatives market for society, because the most important customers of hedging (corporations) are blocked from using it. If special rules are applied for corporate hedgers, there will inevitably be certain shades of gray on what gets done. Yet, when regulators swing over to the other direction and blindly force tiny position limits, it imposes a cost on society. There is a bias towards such over-reaction given that regulators have a different personal perspective on the risk and return from a rational rule set, when compared with the welfare gains to society. I think the real answer lies in more principles based regulation. For physically settled contracts, there should be no dislocation in the delivery process and for cash settled contracts there should be no artificial distortion of the market price. An excessive attempt at writing down rules does not get the job done. For over 20 years, CMIE has computed `market shares' of the companies who compete in a certain product. They have also computed the Herfindahl index of concentration. This data is valuable in obtaining a snapshot of what is happening in an industry. But more interesting, this data goes back to 1990-91, and thus constitutes a valuable historical series using which we can obtain insights into individual industries and the economy. Use the CMIE website http://www.business-beacon.com. This is a pay-per-use site. You can create an account to use this over the net. Start at the tree-structured industry classification. Pick an industry of interest: e.g. Tea. To go further, you need to have a prefunded account. Click on Market share of companies. At this point, you are charged Rs.100. This shows the market share of each company in the paper business. The last row (at the bottom) shows the Herfindahl index. This has been around 0.06 in recent years -- suggesting very little market power. At the right hand top, there is access to a spreadsheet where there is a full time-series for the market share of all Tea companies, going back to 1990-91. At this point, you are charged Rs.250. This spreadsheet has the bottom row with the time-series of the Herfindahl index. Sometimes, an industry (e.g. Two/Three Wheelers) contains market shares data for several sub-components. In this case, the sub-components are accessible from the bottom of the market shares page. Here is an example, for the Two/Three Wheelers industry, where the market shares information defaults to motorcycles (the most important sub-component), but the other sub-components are available by looking below the list of reports.